Are you looking for a safe electric skateboard for your kid? Well, then you have come to the right place. Acton has recently come up with a great line of skateboards in their Blink series. These skateboards are in no way a reflection of professional skateboards, but they are commonly used for short commutes or simply by children to play around. Still, do not be under the notion that this Acton Blink Lite is a toy for children. This skateboard is far superior in its build and design when compared to most children’s skateboards. Its performance is pretty satisfactory even on busy streets and uphill riding. Acton claims that their Blink Lite skateboard is one of the lightest electric skateboards in the world. Is Acton Blink Lite Worth Its Cost? Acton Blink Lite brings forward a sturdy deck that is made of Canadian maple wood. The deck size is pretty conservative – as a 27.5 inches x 8 inches deck resembles a small skateboard. Still, the smaller deck size should not be confused with a lower max load. 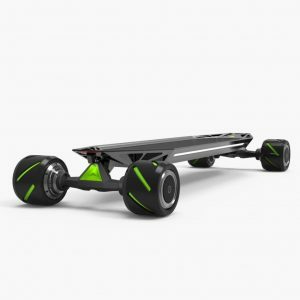 In fact, Acton has already announced that this skateboard is capable of carrying a max load of 180 lbs. Since this board is weighed only 7.7 lbs. it is very light to carry around. This has been quite popular among teenagers and smaller kids who can easily carry this skateboard around. The lower weight has also resulted in an impressive 8% max gradient climb, making it one of the best boards in this category. The deck has special integrated LED lights on its side to determine the battery power. These LED lights also help to indicate the speed at which the skateboard is travelling so that you have a visual note of your board’s speed. Acton Blink Lite offers a single HUB motor system so as to prevent loss of kinetic energy in the wheels. 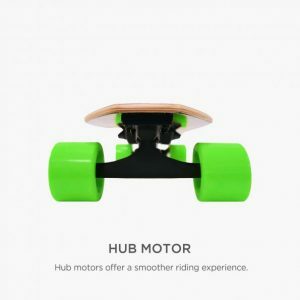 This single hub system offers a single 450 watt powered electric motor that takes care of the skateboard. This single motor is quite powerful, and it is complimented quite well with 3 different ride modes. The different modes include an energy efficient Eco mode, a Normal mode and a Sport mode for varying speeds. Along with that, this Acton Blink Lite comes equipped with 25.5 volts and 2.2 Ah Lithium ion batteries that charge quite fast. 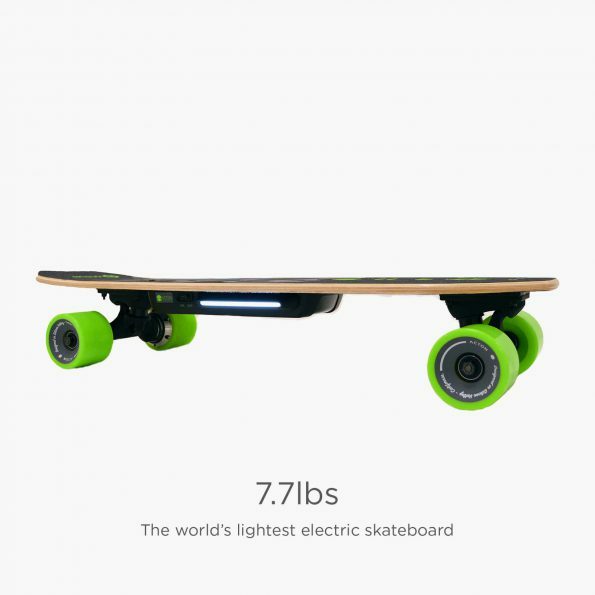 According to Acton, the average charge time for this skateboard is only 2 hours, which is absolutely great considering some of the other options in the market. It provides a strong and powerful 450 watts motor that makes this skateboard a popular choice for regular commuting. Kids can have fun with this skateboard as well, and no additional safety accessories are needed. It has been certified safe for air travel so this skateboard is quite portable. This skateboard offers regenerative braking and lets you slide into a stop, rather than stopping abruptly. Stopping abruptly could affect the balance of the individual. The 70 mm wheels of this skateboard make sure that the board clings to the ground and improves the center of gravity of the individual riding it. The deck is very strong and sturdy. Its Canadian maple wood construction stabilizes the rider very well. This skateboard is entirely splash-resistant, so you do not have to worry about it cleaning it every day you take it outside. In addition to a myriad number of safety features, Acton provides a 6-month warranty on their skateboard and other included accessories. Acton Blink Lite costs $299 on Acton’s official website, and it sells for $249 on Amazon. So, it is definitely competing in the budget category of skateboards. Considering all its salient aspects, this is probably the best skateboard in the market under $300. There is hardly a better alternative to this Acton Blink Lite in its price range. Thus, if you are wondering to get this skateboard, the answer to that question is a certain yes!